Easily Accommodates Individual Needs and Body Types - The Freestyle Pro Keyboard can be configured to meet the unique needs and preferences of most individuals, whether tall or short, broad-shouldered or of slight build. Facilitates Relaxed Position with Maximum Circulation - Complete separation of both left and right keyboard modules enables anatomically neutral and relaxed position of the shoulders, elbow, arms and wrists, greatly reducing the risk of pain and discomfort caused by shoulder rotation, elbow abduction, and ulnar deviation. Learn More About Ergonomic Risk Factors and Sources of Injury. Eliminates Overreaching for the Mouse - The Freestyle Pro Keyboard allows users to keep the mouse or other pointing device right beside the right or left edge of the keyboard. Users who separate the halves may even find that placing their mousing device centrally encourages more balanced ambidextrous usage. By keeping the mouse well within the comfort zone, users can reduce the potential for shoulder, neck and wrist pain arising from repeatedly reaching over the number pad for the mouse. (A right-handed user with a conventional keyboard often must reach 12" for the mouse. The symmetrical, compact design of the Freestyle Pro reduces this reach to under 6" for both left- and right-handed users.) Learn More About Overreaching. Reduces Wrist Extension - Most standard, and even many ergonomic, keyboards are positively inclined (i.e. the number row is higher than the space bar). A positive incline forces the user to lift the hands by bending up at the wrists. Maintaining the hands in this position strains the wrists and the muscles along the top of the hands and the forearms. 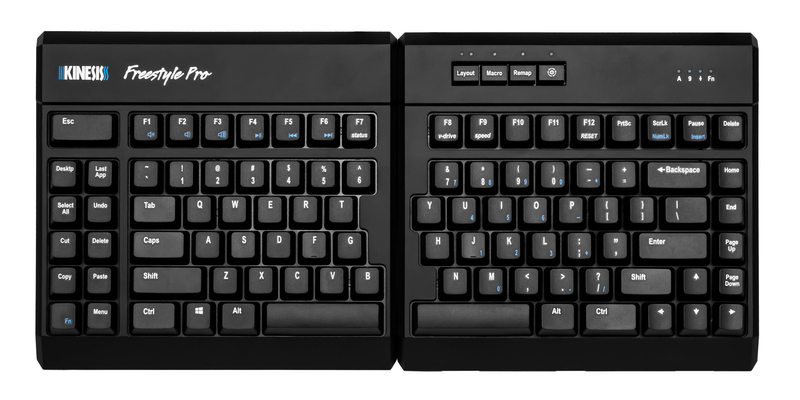 The Freestyle Pro Keyboard has a neutral, low-profile design with 0° slope. The keycaps are negatively inclined at 10°. The result is an overall negative slope that helps to reduce wrist (and finger) extension when using this keyboard. Learn More About Wrist Extension. Reduces Finger Strain and Fatigue - Premium Cherry MX Mechanical Keyswitches offer a 45 gram activation force for consistent performance and load reduction on the fingers. The Freestyle PRO is available with two styles of switches. 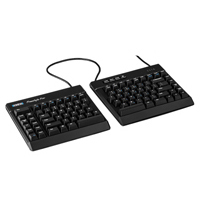 The Cherry MX Brown switches offer an audible click and a tactile activation point to notify people that downward force is no longer required. For users who prefer a quieter key and are willing to "learn" where the activation point is, the MX Silent Red Linear switch model may be preferred. Can Eliminate Wrist Extension - Optional Palm Supports are available to eliminate the potential for wrist extension, whether the keyboard is used flat or tented (using the optional VIP3 Pro Accessory). Learn More About Correct Usage of Palm Supports. Can Decrease Forearm and Wrist Pronation - With the optional VIP3 Pro or V3 Pro accessories attached the Freestyle Pro Keyboard gives users the option of typing with the palms slightly facing each other, rather than in the traditional "palms down" position that can often lead to fatigue or pain in the hands, wrists, elbows and arms. 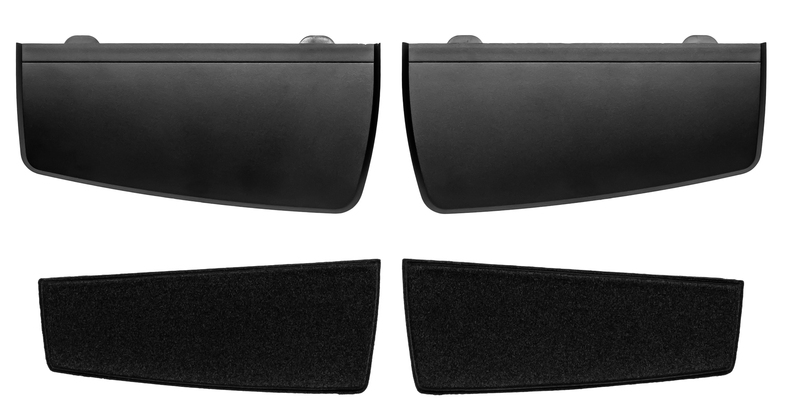 These kits raise the inside edge of each keyboard module, offering tented angles of 5°, 10° and 15°. Learn More About Pronation. Premium Cherry MX Brown Mechanical Key Switches: The Freestyle Pro Keyboard is equipped with high quality Cherry MX mechanical keyswitches. 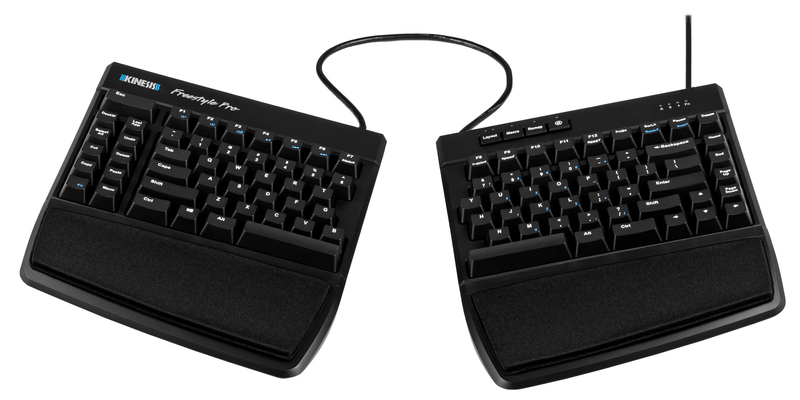 One model employs the Cherry Brown MX mechanical switches that offer a 45 gram tactile activation with audible click. 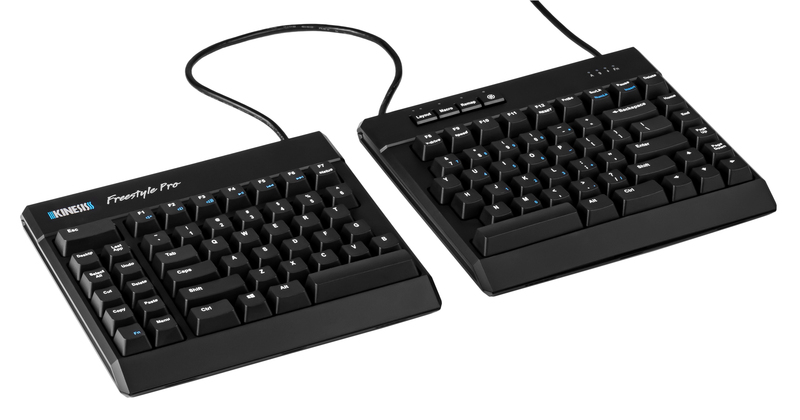 The second model offers the option of the Cherry MX Silent Red Linear switch, also with a 45 gram activation but without either a tactile or audible notification of the activation point. 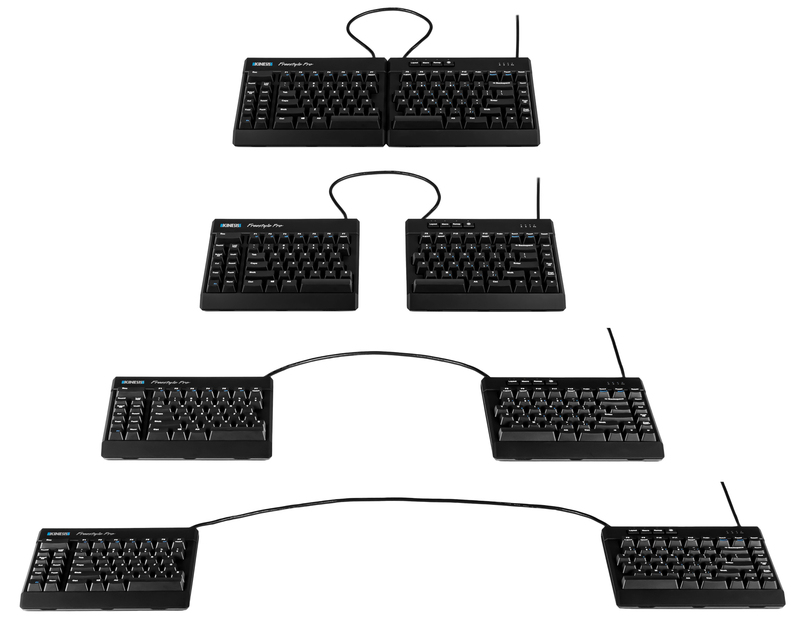 Users who prefer other styles of mechanical switch have the option of considering the Freestyle Edge Gaming Keyboard which is also available with MX Blue (50 gram tactile activation with high audible click), the MX Red (45 gram linear activation), or the Cherry SILVER (quick actuation short travel rated at 45 grams). This gives each user the freedom to choose the feel that best meets their requirements. Programming Cluster & Indicators: The 4-key programming cluster is located at the top of the right hand keyboard module. The LAYOUT key provides quick access to the 3 primary layouts (1, 2, & 3), the MACRO key controls the on-the-fly Macro recording, and the REMAP key controls the onboard remapping. 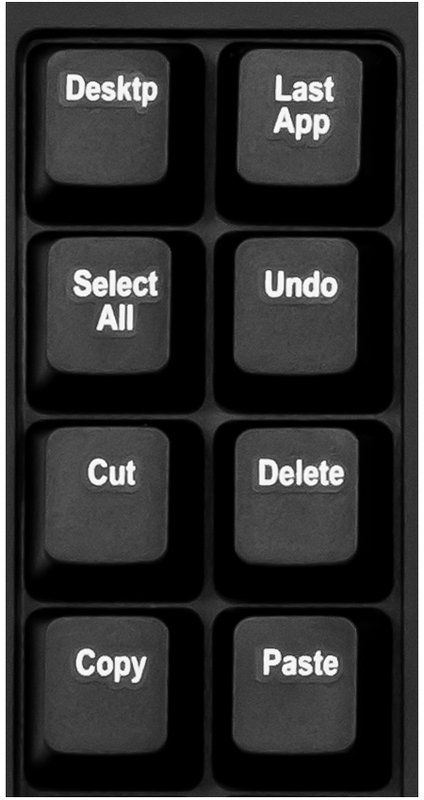 The 4th key is the SMARTSET key which controls all onboard programming shortcuts. The accompanying LEDs advise which primary layout is currently active, whether Macro programming is active (flashing), and whether Key Remapping is in progress. The SmartSet LED flashes to confirm specific programming commands. Driverless HotKeys: A convenient set of 8 pre-programmed HotKeys are positioned on the left side of the left hand module. Conveniently located for quick access, these keys offer one-touch access to common editing and navigation functions. SmartSet APP Programming: This feature-loaded graphical interface App for Windows (pre-loaded) and Mac (pre-loaded) offers all the functions of the SmartSet Programming Engine with additional functionality for power users. Macro Recording: Each layout can store up to 24 macros and each macro can be up to 300 characters long. Macros can be assigned to trigger by a single key or by a 2-key combination. 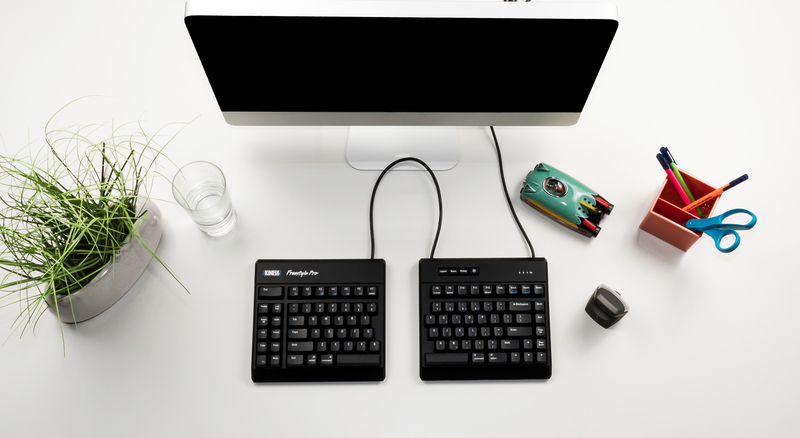 Sleek, Negative Slope Profile Design: The Freestyle Pro Keyboard features an integrated negative slope design which encourages improved finger and wrist positioning. Rather than the keycap tops being level each row is slightly tilted toward the rear. 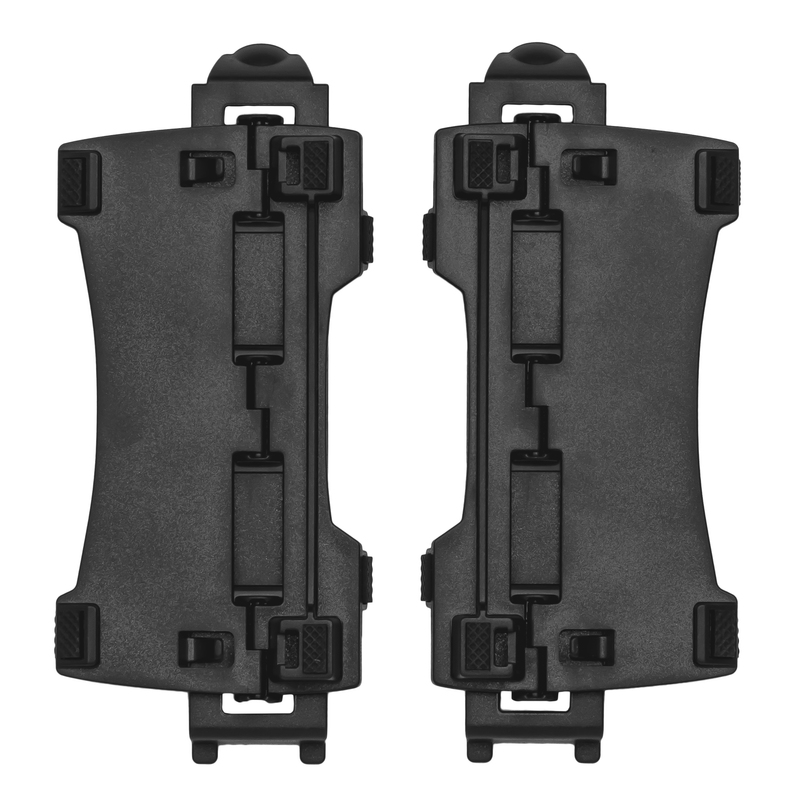 This feature can be enhanced by the addition of either the optional Palm Supports Pro Accessory or the more advanced VIP3 Pro Accessory which offers tenting of 5°, 10° and 15° combined with Palm Supports. Optional Accessories: Users have the option of purchasing the VIP3 PRO (with included Palm Supports) or V3 PRO (tenting option only) Accessory Kits which offer tenting (outward angling) of 5°, 10° and 15° to reduce wrist and forearm pronation. The Pro Palm Supports Accessory is available for users who desire palm supports without the need of tenting. 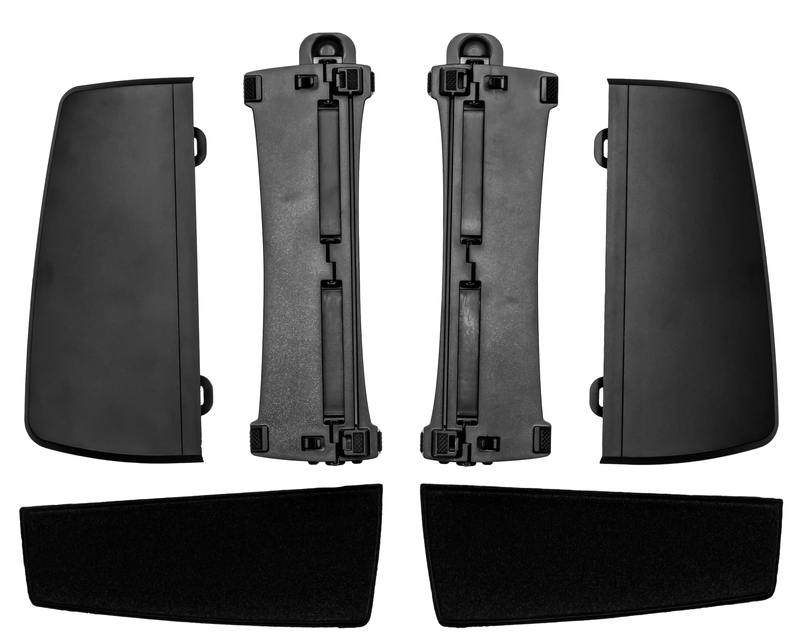 Cushioned Palm Pads can also be purchased for installation on the VIP3 Pro and Palm Support accessories. Note: The VIP3 Pro and V3 Pro Accessory kits are ONLY compatible with the Freestyle Pro and Edge Keyboards and cannot be used with Freestyle Solo and Freestyle2 Models. 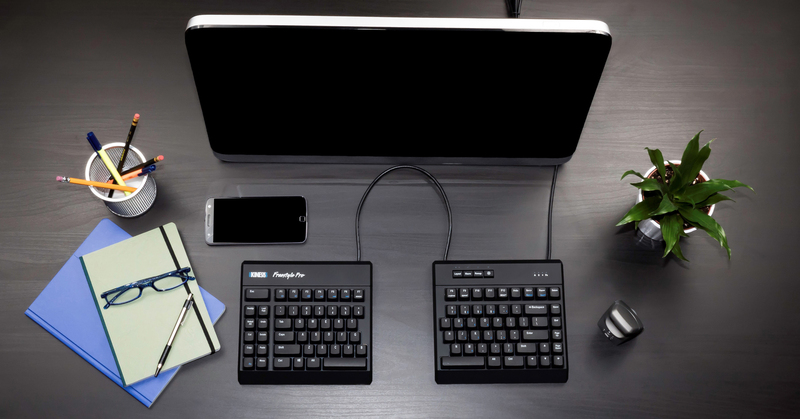 Freestyle Pro Keyboard - Spreads up to 20"
Length of Linking Cable: 20" (50.8 cm) - Compartment in left hand module offers storage for unused cable when less separation is required. Make sure the keyboard is properly positioned. Sit in your usual position at your desk and gently square your shoulders. Allow your upper arms to relax to your waist. Lift your forearms at the elbow and extend your fingers so that there is a straight line from your elbow through the centre of your wrist to your middle finger. Place the two halves of the keyboard on your desk or keyboard tray such that your arms and hands can maintain this position as you type. The modules should be shoulder width apart. Place the mouse on the side of your dominant hand. For most people, the compact design of the keyboard will bring the mouse close enough to the body. However, if your pain is more severe, you can prevent even more movement at the affected shoulder by positioning the mousing side of the keyboard closer to the centre of your body, and then turning it slightly so that your arm doesn't reach past perpendicular to your shoulder when you reach for the mouse. You will then be able to reach the mouse with very limited involvement of the shoulder muscles. If you need to tent the keyboard you may wish to purchase one of the accessory kits which enable you to "tent" the keyboard modules by 5°, 10° or 15°. There are two kits available; the V3 Pro kit offers the basic tenting function while the VIP3 Pro is a combination Tenting with Integrated Palm Supports accessory. Many users prefer the VIP3 Pro option because the integrated palm supports reduce the risk of the wrists dropping into extension. If the embedded numeric keypad is unsuitable for your use and you require a stand-alone keypad you may wish to consider the Low Force Tactile Numeric Keypad (with mechanical keyswitches) or the Freestyle2 Keypad for PC (with membrane keyswitches).